Today I give you my new Bowflex Max Trainer M3 Review 2019. Why? Because you (a lot of you) have asked for it! If you have looked at 2019 Bowflex machines, you’ve taken note of the popular Max Trainer line. You’ve looked at the models, and the new Bowflex M3 – the starter version – caught your eye. But you’re still on the fence, because even though Bowflex is a known name, you like to do your research before you buy. FIRST, DON’T MISS OUT: Spring 2019 is upon us, and the yearly SPRING SALE is here, get some of the best deals of the year on the Bowflex Max Trainers at bowflex.com. Save up to $350 with code SPRING19 (enter your code at checkout – valid until March 31). We’re here to help. Below, we’ll break down the M3 – the good, the bad, and everything in between. By the end, you’ll be a Max Trainer expert, and you’ll know exactly if the Bowflex Max M3 is right for you (or not). Read on. Bowflex M3 Overview – What Makes A Max Trainer Unique? If you haven’t already, navigate to the 2019 Bowflex M3 product page. Take a look at the structure of the machine. It’s different from anything you’ve seen in commercial gyms because it’s a Bowflex. Bowflex prides itself on creating more “human movements” during workout – and the Max Trainer design is a direct reflection of that mindset. The Max Trainer M3 is half stair climber and half elliptical. This combination allows for smoother movements and more calories burned. Using a Bowflex feels more natural than doing any other form of cardiovascular exercise does, and you burn calories faster when you use it, too. That’s what makes the Max Trainer series unique (max trainer reviews overview), and that’s why it’s so popular among those who want to lose weight and tone muscles seamlessly. You hop on and go through the motions; your body sculpts itself without an extraordinary amount of effort from you. Keep in mind that the M3 is the starter model of the Max Trainer series, though. It has the basics to give you this sort of “enhanced” workout, but it’s missing some features that more expensive versions include. Continue on to learn about the good and the bad. The spring is upon us, and the best time to buy Bowflex is now, the Bowflex Max Trainers spring sale has started and on bowflex.com, and you can now find some of the best deals on Bowflex Max Trainers of the year. Use coupon code SPRING19 at checkout, total savings up to $350 (max). The appeal of the Bowflex Max Trainer M3 can be summarized into five easy-to-understand points. Read them below and you will know everything. The issue with exercise is that you have to do a lot of different exercises if you want to look good all around your body. If you’re a guy and you only go jogging, you’ll never get juicy biceps or pectorals. Similarly, if you’re a girl and you only use the weight machines in the gym, you might not get the hips, thighs, and glutes you’re after. Instead, you have to construct a full-body workout. For example, if you went for a run, afterwards, you would have to do pushups, dips, core work, rows, and everything else in between in order to work every muscle. It’s a hassle, and not many people have the time or energy to construct the perfect multi-faceted workout plan. The Bowflex M3 solves this problem by working every muscle in your body simultaneously – seriously. The arm and leg movements activate every muscle you have. That’s the Bowflex motto – “truer human movement”. When you complete a workout, it’s like you just completed a full, multi-faceted workout – but all you did was hop on the Max Trainer. The result of this is a body you love looking at. We look our best when we lose fat and the tone muscles all around our bodies – not just some of them. You tone all of your muscles and lose weight everywhere with a Max Trainer. And it gets even better than that – continue on. Yes, really. When you work all of your muscles at once, you are activating the maximum number of fat-burning mechanisms in your body. If you were just jogging, you would be working just your legs, and your calories burned would reflect that. But remember, the Max Trainer works everything. For comparison, during a normal 15-minute workout on the Bowflex Max M3, you can burn up to 280 calories going at a normal pace. If we use the example of jogging, during a 15-minute jog, you can burn just over 100 calories. You’re activating everything, so you’re burning the highest number of calories that your body possibly can. This is one of the major, major appeals of the Max Trainer, and the M3 in particular. You can get this improved weight loss without spending too much money. Doing strenuous workouts will put stress on your joints and ligaments. This can lead to acute or chronic injuries (you pull something by accident, or you gradually wear something down over time). The Bowflex has none of these problems because there is no impact. If you were running, you would put your knees at risk. The Max Trainer puts nothing at risk. And you’re not prone to other types of injuries, either. For example, on a faulty elliptical, extended use can wear down your joints and ligaments with unnatural movements. On a stair climber, you can strain too hard and pull something in your upper leg. With the Bowflex, it’s impossible to strain yourself unless you are actively trying to – and we don’t think you’ll be doing that. So far, we’ve covered that the Max Trainer M3 engages your full body, burns the highest number of calories possible, and does not leave you open to risk of injury. The M3 Bowflex Max Trainer has everything you need for a comfortable workout, too. The foot pads are quite large. There is a convenient cup holder. There is even a mount for your phone or tablet so you can listen to music while keeping your hands free. All of this is packed together in a sleek, 2019 machine. The unit supports up to 300 pounds (lbs.) of weight and can run for extended periods of times with no problems. To top it all off, the Max Trainer M3 looks beautiful and runs beautifully, too. As we mentioned, the Bowflex M3 is the starter model of the Max Trainer series. Despite all of its perks, it’s missing a few features, but nothing big. The M5 (now M6) and the M7 (now M8) have both bluetooth integration and a set of fairly nice speakers. You can load up a playlist or movie/TV show and you will be surrounded by sound as you work. The Bowflex Max M3 doesn’t have that, so you will have to use your own speaker system, or keep using good old-fashioned headphones. Overall, customers said that the lack of speakers wasn’t a big deal – since there’s no impact, it’s easy to carry your smartphone or put it in the holder. The M5/M6 and the M7/M8 both come with a few different options for heart rate monitoring. The M3 does not have that. If you’re a specialized athlete who needs to be constantly checking his or her pulse, you’ll want to upgrade. For the average exerciser, though, the M3 and its lack of heart rate grips is A-OK. There are just two preset workout programs included with the Bowflex Elliptical M3. One of those is Manual, meaning you choose how you work out, and one is MAX Interval, the fabled workout program where you lose up to 280 calories in 15 minutes with the Max Trainer. In comparison, the M5/M6 and M7/M8 have 10+ preset programs each. They range from burning calories to burning fat all the way to gaining muscle. But aside from the lack of workout programs (and the other small features listed), the M3 is a solid starter unit as far as exercise machines go. You don’t ever want to buy the barebones model of a normal exercise machine, but when it comes to Bowflex, you can. Not everyone will find the M3 particularly useful. But others will find it to be a godsend. Weight loss and fat burning are not part of your goals. If you’re trying to be a bodybuilder, the M3 can set you up for success, but optimized human movement means your entire body gets stronger at once. You don’t put extreme strain on certain muscles to grow them like bodybuilders do, you should review your options. You are a fitness junkie who needs every bell and whistle. As we covered, the M3 lacks some things like heart rate grips. Upgrade to the M5/M6 or the M7/M8 if you train with intensity rather than exercise for results. You like the idea of a all-in-one workout. 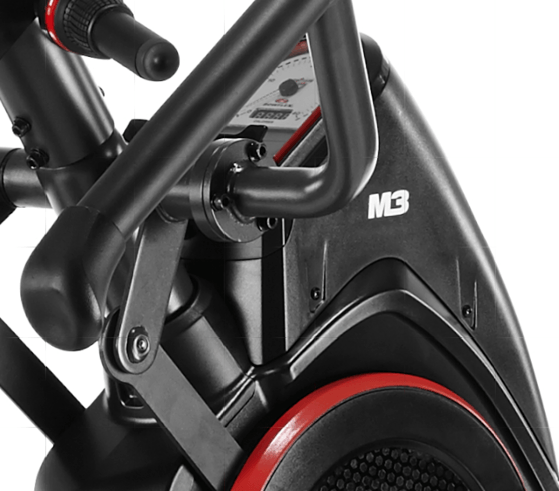 The Max Trainer M3 is the only thing you will need to do in your workout regimen. And you won’t neglect a single muscle! You like the idea of better-than-normal calorie and fat burning. The unique hybrid design means that you get the best return on your effort. You will burn calories faster, and because you are working every muscle, you will lose fat from every part of your body. You’re okay with a starter model. Not everyone needs every feature in the book. If you exercise casually, the M3 will be more than enough for you. We recommend visiting the official product page and make your purchase there. Or, if you feel you might need more features in your Max Trainer, read our comparison of the Bowflex Max Trainer M3 and the M5/M6. The 2019 Max Trainer series is Bowflex’s #1 best-selling product line. The machines combine elliptical and stair stepper movements to give you a smooth, full-body, and extremely effective workout. 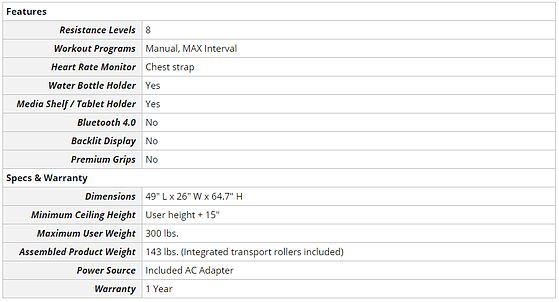 The 2019 Bowflex M3 is the barebones model of the series, which means that it’s the cheapest, and it also has the fewest features. You will save close to $600, but you will sacrifice a few features that dedicated athletes might miss. Overall, the M3 is a very smart buy for anyone who likes the appeal of a full-body workout that burns more calories at a quicker rate. Especially for weight loss and fat burning, the Max Trainer series cannot be beat. And the M3 is the cheapest way to start using a Max Trainer today. Navigate to the product page to place your order. Shipping is discounted and there is a no-questions-asked 6-week return policy. If you get the Bowflex Max M3 and you don’t love it, just send it back with a prepaid label and your money will be back in your bank account within days. If you’re still on the fence, after reading this review, check out our comparison of the Bowflex M3 and the M5/M6 (see above). Otherwise, head to the Bowflex Max Trainer M3 product page, make your purchase, and start your weight loss journey with one of the most effective workout machines known to man.